I cannot write anything without urging you to donate to the Katrina Relief fund. You can donate here, which is the Amazon.com donation site. Please dig deep into those pockets. If I have helped you make any money on this website, do it for me. Again thinking of New Orleans, I would like to use this entry to think of the many cultural things that make this devastated city a jewel that shall need to be restored. One of the things I enjoy when visiting New Orleans are the wonderful pralines! If you haven't visited a New Orleans praline shop, well you haven't had that treat! 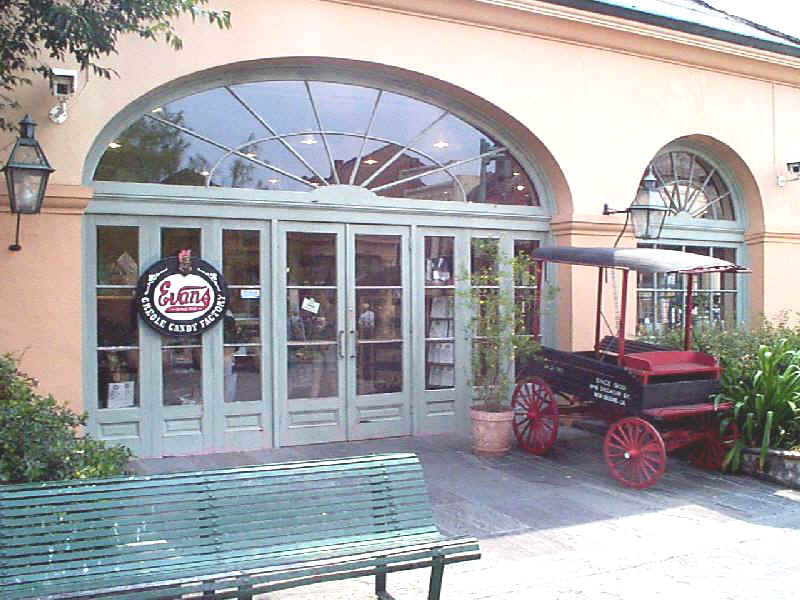 The Evans Creole Candy Factory on 848 Decatur is worth a visit as soon as they get things back up and going in New Orleans. There is nothing better than a freshly prepared New Orleans praline to hit the sweet spot! Anyhow, back to the stocks! Last weekend I decided to start a systematic review of the stocks I hold in my actual Trading Account. I discuss many stocks on the blog; I try to let you know when I own some shares and when I sell them. The stocks I actually own are actually a very small percentage of stocks examined on Stock Picks. 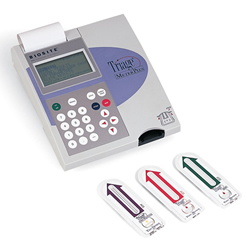 I first posted Affymetrix (AFFX) on Stock Picks on January 27, 2005, when it was trading at $40.62. I purchased 160 shares of Affymetrix that same day with a cost basis of $40.98/share. I hit my first sale point (with about a 30% gain) on 5/26/05, and sold 1/4 of my holdings (40 shares) at a net of $53.18, for a gain of $12.20 or 29.8%. Currently, I own 120 remaining shares which closed at $49.07 on 9/3/05, for a gain of 19.75%. I shall be selling my second portion at a gain if the stock is up 60% or about $65.57, or at $40.98 on the way down, in which case I would be selling all remaining shares. Looking for the latest quarter, AFFX reported 2nd quarter 2005 results on July 21, 2005. Revenue came in at $84.1 million for the second quarter, up from $79.8 million in the same quarter the prior year. Net income came in at $7.8 million or $.12/diluted share, up from $7.0 million, or $.11/diluted share last year. However, as reported, analysts had been looking for $.17/share on sales of $88.1 million. Thus, results disappointed on both the revenue and earnings front. In addition, the company guided lower for the upcoming quarter, forecasting a loss of $(.06)/share, on revenue of $95 million. The "street" had been looking for a profit of $.29/share, on revenue of $101.7 million. Needless to say the stock sold off on this double disappointment. The stock price, however, has been fairly resilient, probably on anticipation of more longer-term positive results. We can see that the stock has been trading quite strongly higher since breaking through "resistance" at around the $25 level in July, 2004. The stock did appear to be a bit "ahead of itself" as it distanced itself from the support line, but the price action has not apparently broken down and recently has been moving higher through the month of August, 2005. So what do I think? 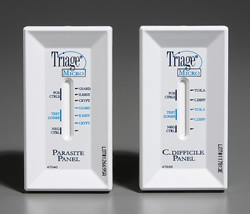 Well, the future of gene identification laboratory tests is really quite unlimited. That is at least the story part of the equation. The last quarter was a disappointment, and the next quarter too will be a drag on performance. However, long-term, the story part of the equation is likely still intact. And meanwhile, I shall be watching the stock price and allow the market to "tell" me what I need to do to manage this position! Thanks again for dropping by. If you have any comments or questions, please feel free to email me at bobsadviceforstocks@lycos.com or leave them right here on the blog! Remember to think of all of the people displaced, and remember the good times of New Orleans, a city that will rise again between the waters of Lake Pontchartrain and the Mississippi. A Thank You to "Deep Market" Blog! Eric Cahoon writes a blog, Deep Market and has included an entry dated September 1st 2005 that is very kind and complimentary to this blog, Stock Picks Bob's Advice. I would simply like to say "Thank You!" for your kind plug. I haven't met you, but as an amateur investor, I appreciate your kind words. I work hard at explaining my thinking and if I have added some understanding to the world of investing, well that is about all I am about. And yes, you caught me getting behind at updating my other pages including my trading portfolio. I have a three day weekend, so maybe I can squeeze a few moments into updating the blog! There are a lot of stock market related blogs out there. I have looked at many of them and have been impressed with the effort that some people put into providing (potentially) valuable analysis for free. Of course, there are a lot of splogs - spam blogs - also. However, in looking through the universe of stock blogs, I found Stock Picks Bob’s Advice website. From what I can tell, it looks like Stock Picks Bob has been doing a great job documenting his ideas, background information, and charts since 2003. Golly, and what a history of postings to read through. Did I mention the pretty pictures? Not just the charts, but also nice photos. 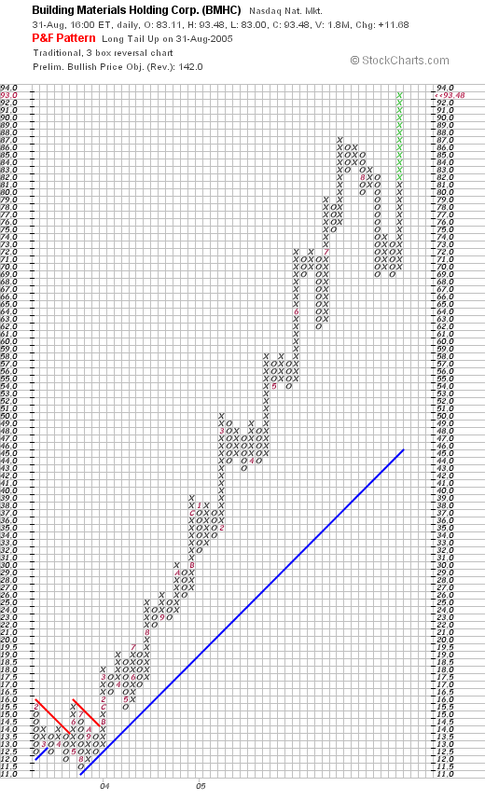 I am guessing that Bob has an interest in Point and Figure charting - most of the charts I saw use P&F. As always, please remember that I am an amateur investor so please consult with your professional investment advisor prior to making any decisions based on information on this website. Truer words have not been spoken, but I doubt most “professional investment advisors” would be willing to have their trading records in an open forum like Bob has his. In the world of brooding and negative blogs, Bob provides a useful and positive source of information. I shall try to work hard to work up to your kind words of recommendation! A Reader Writes: "What would be some stocks that I could fall into?" Hello Friends! Thanks so much for stopping by and visiting my blog, Stock Picks Bob's Advice. As always, please remember that I am truly an amateur investor, so please remember to consult with your professional investment advisors prior to making any investment decisions based on information on this website. I always enjoy getting mail and questions from readers. For me, it makes the whole writing about stocks more interesting. Unfortunately, I am not qualified to give individual advice to anyone. So when I received this letter, I knew I couldn't and shouldn't answer specifics, but let me try to answer the question with some general thoughts about investing. My name is Long P---, I am currently living and working in Baton Rouge for E-911 service restoration for all wireless carriers. Honest to say, I would like to take a chance to find a nitch in stock investment during this period of time. What would be some stocks that I should fall into? BMHC? You are alway said on your blog that "I am an amateur with stocks" but I believe that you could lead me a good way. I want to take an opportunity to be sucess in life and helping other during their down time. Well Long, that you so much for writing. I really am an amateur investor. I am not a certified financial advisor or any such thing. I just like to pick stocks and talk about them. There are literally hundreds of stocks on the blog that I review, and if you go through some of them, I am sure you may find stocks that fit your particular interests. Thank you for working in Baton Rouge helping get New Orleans back on E-911 service. Needless to say, that is very important work and much needed for all of the hurricane victims. I really cannot tell you which stock to invest in, basically because I really don't know. I suspect that stocks that are involved in construction, whether it be a cement manufacturer, a lumber stock, a building supply firm, or the like, will find their products and services in great demand. My own strategy of picking stocks is to let the stocks come to me rather than chasing after stocks which I figure ought to do well! I can only suggest that you consider doing the same. As you may know, if you read my blog, I start with the top % gainers of the day. I use CNN Money website to find this, but this is available on USA Today and elsewhere. After that I go to Yahoo and research the latest quarter. I don't do anything complicated, I just see if their revenue and their earnings are positive and growing. Next to Morningstar where I look at revenue and earnings, as well as free cash flow (I insist it be positive and growing if possible), the balance sheet, and some key statistics. If everything looks good, well then I take the plunge. I like to sell my losing stocks quickly and then slowly sell my gaining stocks, selling 1/4 of my remaining positions at specified gain points. Internally in the portfolio, I use a sale at a gain as a "good news signal" that enables me to add a position (up to my maximum # of positions which is now 25), and use a sale at a loss or on bad news as a "bad news signal" which directs me to "sit on my hands", that is, avoid reinvesting proceeds of stocks that were recently sold under less than ideal circumstances. I don't have any magic about what I do. Lots of old-fashioned 'elbow grease' as my mother would like to say. Just do my homework, remain skeptical, and be quick to act. Good luck and thank you from all of us for your work in getting New Orleans, the "Big Easy" back on its feet! Before I post, I wanted again to express my concern and prayers for all of those who have been impacted by the catastrophe called Katrina. One of the fun things to do in New Orleans is to ride the steamboat. 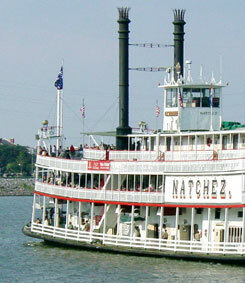 Here is an image of the Steamboat Natchez. Anyhow, back to stocks! Scanning through the list of top % gainers on the NASDAQ, you can see what I would call "Katrina-related" stocks. These are companies that investors, or speculators, believe may benefit from the eventual massive investment in rebuilding and repair of the hurricane disaster region. One company that made the list today is Cavco Industries Inc. (CVCO) which, as I write, is trading at $36.00 (in an otherwise weak market), up $2.46 on the day for a 7.33% gain. I do not own any shares nor have any options on this stock. 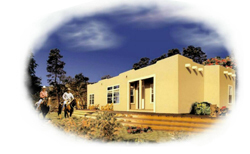 According to the Yahoo "Profile" on Cavco, the company "...engages in the design and production of manufactured homes primarily in the southwestern United States." I would expect that this type of business may well be in great demand with the damage to housing from the hurricane! 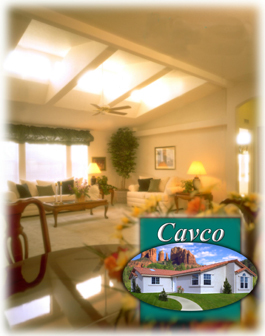 On July 20, 2005, Cavco reported 1st quarter 2006 results. For the quarter ended June 30, 2005, net sales grew 28% to $45.9 million from $35.9 million the prior year. Net income was up 107% to $3.5 million, compared with $1.7 million the prior year, and on a per share basis this worked out to $.56/diluted share, up from $.27/diluted share last year same period. What about longer-term results? Looking at the Morningstar.com "5-Yr Restated" financials on CVCO, we can see that revenue has been steadily growing from $95.5 million in 2001 to $167.4 million in the trailing twelve months. Earnings reports actually start in 2005 with $1.54 reported and $1.81 in the trailing twelve months (TTM). Free cash flow is positive and appears to be growing with $2 million reported in 2003, expanding to $16 million in the TTM. The balance sheet is very strong with $50.4 million in cash and $26.2 million in other current assets, enough to cover both the $29.9 million in current liabilities and the $9.6 million in long-term liabilities more than 2x over. Reviewing Yahoo "Key Statistics" on CVCO, we can see that this is a very small company with a market cap of only $226.37 million. The trailing p/e is 19.82 and the forward p/e (fye 31-Mar-07) is even nicer at 15.0. With this excellent valuation (imho), it is no surprise that the PEG is 0.71. Anything under 1.0 is a good value in general. Insofar as the price/sales ratio is concerned, CVCO appears moderately priced. That is, within its industrial group of "Manufactured Housing" it is not a screaming steal! Topping this list is Nobility Homes (NOBH) with a price/sales ratio of 2.1. This is followed by CAVCO (CVCO) at 1.3, Champion Enterprises (CHB) at 0.9, Palm Harbor Homes (PHHM) at 0.7, MODTECH Holdings (MODT) at 0.6, and Cavalier Homes (CAV) at the bottom of the pack with a price/sales ratio of 0.4. Other statistics from Yahoo show that the company has 6.29 million shares outstanding. As of 8/10/05 there were 31,610 shares out short representing 0.50% of the float or 2.9 trading days of volume. This doesn't look significant to me. We can see what looks like an explosive chart with a shart rise from $6.50 in June, 2003, to its current level at around $36. 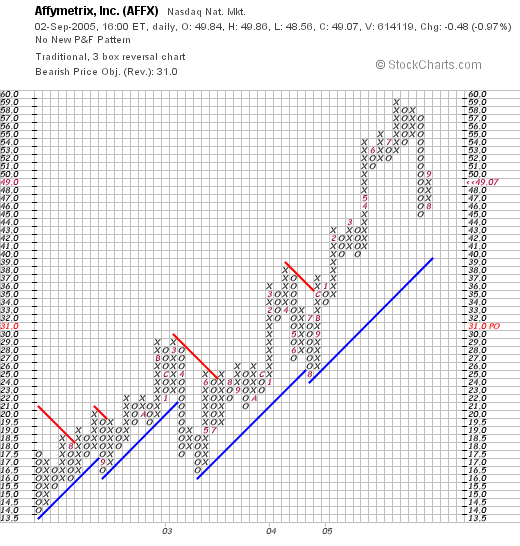 The stock is trading above its support line and does not appear to have found much resistance at this time. So what do I think? Well, I just bought some GI so I am not in the market for a stock at this time. However, I like what I see on this stock. Let's review some of the things I have written: the stock is making a nice move higher today and has a bit of a "story" associated with the hurricane. Underlying this move, was a strong quarter just reported, a five year record of steady growth, free cash flow is positive and growing, the balance sheet is excellent, and valuation is reasonable with a p/e under 20 and a PEG under 1.0. The stock is not the cheapest in its group by the price/sales analysis, but still not really that overpriced either. Finally, the chart looks nice! On the downside, the threat of continued increases in the interest rates may put a damper on housing sales and all of the companies associated with construction or manufacture of housing. However, with the Katrina disaster, I don't believe the FED is going to aggressively push rates higher for the time being. Just a hunch! Anyhow, I hope you enjoyed that stock. It is fun to find stocks that have all their "ducks in a row"! If you have any comments or questions, please leave them on the blog or feel free to email me at bobsadviceforstocks@lycos.com. As you may note from the previous post, I sold a portion of my Meridian Bioscience (VIVO) at a 60% gain level. This "entitled" me to add a position, considering I am at 24, under my 25 goal, and I set to work scanning the lists of top % gainers. Noticing that Giant Industries (GI) was doing quite well today, in fact trading at $53.02, up $3.77 or 7.65% on the day, and that I had just discussed the stock on stock picks, knowing it met my criteria, I jumped in and purchased 160 shares at $53.15 a few moments ago. So much for that nickel in my pocket :). I always seem to find something to do with it! Thanks again for stopping by. If you have any comments or questions please feel free to leave them on the blog or email me at bobsadviceforstocks@lycos.com. A few moments ago, my shares of Meridian Bioscience (VIVO) hit a sale point on the upside and I sold 75 shares, 1/4 of my position of 300 shares I currently held, at the 60% gain point. The exact sale was 75 shares at $27.70. These shares were purchased 4/21/05 with a cost basis of $16.67, so this was a gain of $11.03 or 66.2% on the upside. As you probably know, I like to sell my losers quickly if they hit an 8% loss. I sell my gainers slowly, and partially, trying to sell 1/4 of my holdings at 30%, 60%, 90%, 120%, 180%, 240%...etc. gain points. Also, if I am under 25 positions (my goal), this "entitles" me to add a position. Thus, the nickel is burning a hole in my pocket already. I shall be scanning the top % gainers to see if there are any candidates there today that I find interesting. I shall keep you posted! Please leave a message on the blog or email me at bobsadviceforstocks@lycos.com if you have any comments, or questions. Before writing anything about stocks today, let me take the time to express my personal sympathy to all of you who might have lost friends, family, property, or your way of life in the disaster called the Katrina hurricane. My wife's family is from New Orleans. Her parents got out but likely lost their home. We are still waiting to hear whether her brother, who stayed due to medical problems, is alive and well. Please keep him in your prayers. New Orleans shall return, the water shall be drained, and there will be more Mardi Gras parades, beignets, and Crawfish etouffee. But it shall be a difficult time for many people. Let us remember the positive things about New Orleans and work to generate a new enthusiasm that will bring businesses, tourists, and conventioneers once again to the tourist destination of America. 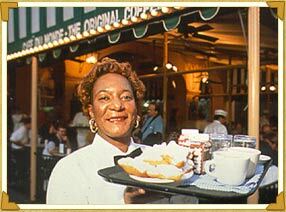 Here is a picture from Cafe Du Monde, one of my favorite places to get beignets and cafe du lait. We shall all be visiting once again, hopefully in the not too distant future, dusting off our over-powdered-sugared doughnuts from our clothes! Back to stocks! 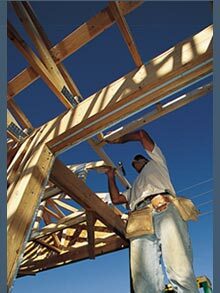 It seems that many of the stocks moving higher today included building materials and roofers including lumber and cement. On today's list of top % gainers of the NASDAQ was Building Materials Holding Corporation (BMHC) which closed at $93.48, up $11.68 or 14.28% on the day. I do not own any shares or options in this stock. For the quarter ended June 30, 2005, sales increased 33% to $1.27 billion, compared to $.96 billion in the prior year same quarter. Net income was $33.3 million or $2.28/share up from $12.6 million or $.92/share last year. Looking a bit longer-term at the Morningstar.com "5-Yr Restated" financials, we can see a nice picture of revenue growth from $1.0 billion in 2000 to $2.4 billion in the trailing twelve months (TTM). Earnings during this period have been a bit erratic, dropping to $.53/share in 2002, but have increased steadily since that time to $6.39/share in the TTM. BMHC started paying dividends in 2002 when $.05/share was paid. This has increased to $.34/share in the TTM. Free cash flow, except for a $(3) million in 2003, has been positive and growing from $16 million in 2002 to $105 million in the TTM. The balance sheet looks solid with $37.8 million in cash and $528.7 million in other current assets according to Morningstar, balanced against $263.1 million in current liabilities and $225.3 million in long-term liabilities. What about valuation? Taking a look at Yahoo "Key Statistics" on BMHC, we can see that this is a mid-cap stock with a market capitalization of $1.33 billion. The trailing p/e is very reasonable (imho) at 14.65, with a forward p/e even nicer at 14.38 (fye 31-Dec-06). Thus the PEG ratio is under 1.0 at 0.88. Using my Fidelity account for research, I found that BMHC is sitting in the "Home Improvement Stores" Industry Group and the price/sales is reasonable relative to the other stocks in the group. Fastenal (FAST) tops the list at 3.3, Lowe's (LOW) is next at 1.3 and Home Depot (HD) at 1.1. BMHC is next to last in the group with a price/sales ratio of 0.5, with Builders Firstsource (BLDR) the most reasonable with a price/sales of 0.3. Looking at other Yahoo "key statistics" we can see that there are only 14.24 million shares outstanding. As of 8/10/05, there were 634,910 shares out short, representing 4.50% of the float or 1.7 trading days. This does not look significant to me. The company does pay a small dividend of $.40/share yielding 0.50%. The last stock split was a 3:2 split in March, 1994. We can see what looks like an extremely strong stock graph that appears to be showing increased volatility. Since late July, 2004, when the stock broke through resistance at $14.00, the stock has moved almost perfectly higher to its current level of $93. So what do I think? Well, even though this sounds something like profiteering on disaster, a building stock adds an air of optimism about the New Orleans catastrophe. The latest quarter was very strong, the past five years have been growing steadily, value is great with a PEG under 1.0, a price/sales low in its industrial group, and even the P/E being under 20 is pretty reasonable. The balance sheet looks nice, and the company even pays a growing dividend. On the downside, there is some small softness in the housing market, and notwithstanding the Hurricane, this building cycle may be late. However, consider the size of the building effort in New Orleans! Boggles the mind. On top of all of this, the chart looks great! Now, if I only could sell a bit of Cal Dive (CDIS) or my Mentor (MNT) which is flirting with a sale at a gain....hmmm....anyhow, please feel free to comment on what I write here on the blog, or email me at bobsadviceforstocks@lycos.com. We opened with beignets and let us close with Jazz! 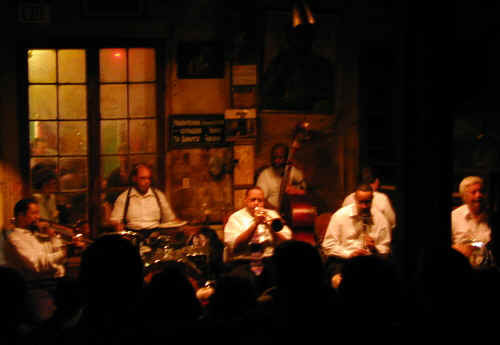 This is a photo I found on a Neurosciences Meetin Website of the Preservation Hall Jazz Band! Enjoy! P.S. : My niece just called and my brother-in-law just showed up in Baton Rouge. Hospitalized for dehydration, he should be fine. Let us pray for so many other victims of this disaster! This post would be incomplete without a word of concern for the health and welfare of everyone affected by hurricane Katrina. Like many, I have relatives in the region and will be waiting to hear from all of them that they withstood the storm and are in good health. Times like these remind us that gains in our portfolio, clever approaches to investing, etc., are for naught if you and your family aren't safe and in good health! I was looking through the list of top % gainers on the NASDAQ and I came across Biosite (BSTE) which closed at $59.90, up $6.28 or 11.71% on the day. Although I have owned shares in the past, I do not currently own any shares or options in this company. 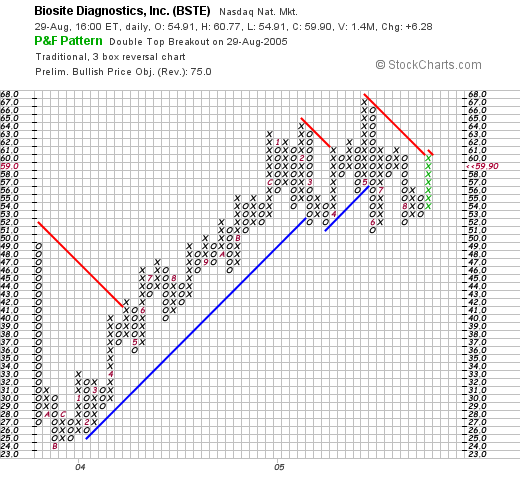 I first posted Biosite on Stock Picks on June 25, 2003 when it was trading at $48.15. The stock has appreciated $11.75 since posting or 24.4%. According to the Yahoo "Profile" on BSTE, the company "...engages in the discovery and development of protein-based diagnostics and antibody development technologies in the United States." Looking for the latest quarterly report, I noticed that Biosite reported 2nd quarter 2005 results on July 26, 2005. For the quarter June 30, 2005, revenues grew 23% to $73.8 million from $59.9 million last year. 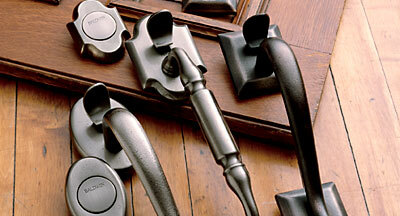 In addition, net income came in at $14.0 million, a 40% increase over the 2nd quarter 2004 results. On a diluted earnings per share basis, this worked out to a 29% increase to $.76/share, up from $.59/share last year. Looking at the Morningstar.com "5-Yr Restated" financials on BSTE, we can see a beautiful picture of revenue growth with revenue climbing from $55.0 million in 2000 to $273.0 million in the trailing twelve months (TTM). Earnings during this time have also grown steadily from $.41/share in 2000 to $2.80/share in the TTM. Free cash flow has been erratic, a function of fluctuating capital spending, with $12 million in 2002, dropping to $(41) million in 2003 but improving to $8 million in the TTM. The balance sheet is gorgeous with $119.5 million in cash and $71.9 million in other current assets. This is enough to pay off both the current liabilities of $44.1 million AND the $16.1 million of long-term liabilities combined more than three times over. Looking at Yahoo "Key Statistics" on BSTE, we can see that this stock is a mid-cap stock with a market capitalization of $1.03 billion. The trailing p/e isn't too high at 21.35, with a forward p/e (fye 31-Dec-06) of 19.39. The PEG is reasonable at 1.23 (5 yr expected). Behring (DADE) at 2.0. Overall, Biosite is nicely priced within its particular industrial group. Going back to Yahoo for some more statistics, we find that there are only 17.25 million shares outstanding. Interestingly, there are 3.52 million shares out short as of 8/10/05, representing 21.90% of the float (! ), or 11.9 trading days of volume. This is actually up from $3.42 million shares out short last month. With the move higher today on some good news, we may be witnessing a bit of a "short squeeze" in this stock! Yahoo reports no cash dividend and no stock dividends are reported as well. We can see what looks less than convincing insofar as stock strength. From November, 2003, when the stock was trading at $24, until February, 2005, when the stock peaked at $65, the stock has been moving higher. Recently, the price broke down as it crossed support levels at $57, to drop to $51, where it appears to be finding new price support. The stock has moved higher today, breaking through the latest resistance level, but a price move up to $62 or higher would be more convincing. So what do I think? Well, it sure was a nice move higher today! And the latest quarter was beautiful. The morningstar.com looks nice with steady revenue and earnings growth. Free cash flow has been a bit erratic but is positive at this time and the balance sheet looks just fine. Finally, valuation appears reasonable and the stock chart looks a tad weak with the stock mostly just going sideways. However, the stock is certainly not over-extended. To top it off, there are loads of short-sellers out on this stock, so there is a bit of pent up demand as the stock price moves higher. If I were in the market for a new stock, I certainly would be looking at this stock. In any case, thanks again for dropping by. I hope you find my discussions entertaining and educational. If you have questions or comments, please leave them right here on the blog or email me at bobsadviceforstocks@lycos.com. Introducing a New Discussion: "Weekend Trading Portfolio Analysis"
Hello Friends! Thanks so much for stopping by and visiting my blog, Stock Picks Bob's Advice. As always, please remember to consult with your professional investment advisors prior to making any decisions based on this website as I am just an amateur investor who likes to write and share ideas about stocks! Much of my time spent on this blog is devoted to presenting ideas on stocks, most of which I never have purchased. Alongside this, I like to tell you about the stocks that I actually buy, sell, hold, make money and lose money on! Since I spend some time each weekend looking at past ideas, I thought it might be helpful to review what has actually happened in my own trading account, which consists of stocks I have selected from the vast numbers discussed here. What I would like to try to do is to go alphabetically through my trading account, discussing one stock each week, reviewing my trading history, looking at current charts, and noting what action I may soon be taking. This will help you understand what I actually own and what I am just discussing. The first stock to be discussed is Alliance Data Systems (ADS) which I acquired 200 shares of in my trading account on 6/16/05 at a cost basis of $39.10. ADS closed on 8/25/05 at a price of $41.79, for an unrealized gain of $2.69/share or 6.9%. I have not sold any portion of this stock, and am waiting either for a 30% gain on the upside, or an (8)% loss on the downside to be selling. I shall sell the entire position on the downside, but only 1/4 of my shares (50 shares) at that first sale point. 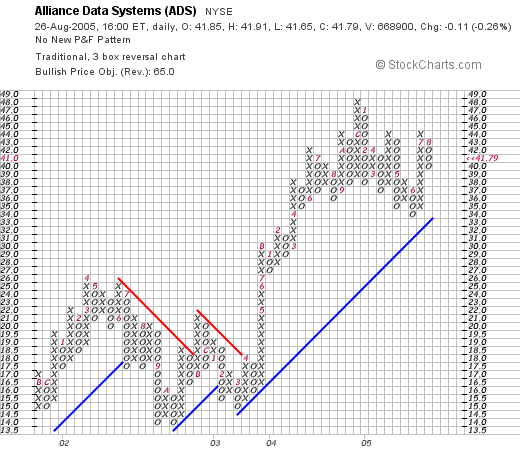 I first posted Alliance Data Systems (ADS) on Stock Picks on 8/1/03 when it was trading at $28.45. Thus, the stock has appreciated $13.34/share or 46.9% since I first mentioned it on the blog, but actually only 6.9% since I purchased it only a little over two months ago. According to the Yahoo "Profile" on ADS, the company "...and its subsidiaries provide transaction services, credit services, and marketing services in North America." On July 20, 2005, ADS announced 2nd quarter 2005 results. For the quarter ended June 30, 2005, revenue increased 24% to $370.6 million compared with $299.7 million last year. Net income climbed 23% to $34.4 million or $.40/diluted share up from $28.0 million, or $.33/diluted share the prior year. In addition, the company guidance for 2005 for earnings from $1.87-$1.90 to $1.92-$1.95/share. Checking the Morningstar "5-Yr Restated" financials, we can see a picture of steady revenue growth from $0.7 billion in 2000 to $1.4 billion in the trailing twelve monts (TTM). Earnings have increased from $.31/share in 2002 to $1.34 in the TTM. Free cash flow has been solid if not consistently increasing, but has increased from $80 million in 2002 to $242 million in the TTM. The balance sheet looks good with $100.4 million in cash and $508.5 million in other current assets, easily covering the $475.7 million in current liabilities and making a small 'dent' in the $753.0 million in long-term liabilities. Looking at Yahoo "Key Statistics" on ADS, we find that this is a large cap stock with a market capitalization of $3.49 billion. The trailing p/e is a little rich at 31.30, but the forward p/e (fye 31-Dec-06) as estimated is nicer at 18.66. The PEG (5 yr expected) is a bit over 1.0 at 1.37. Looking at Fidelity.com for research, I found that ADS is in the "Information/Delivery Svcs" Industry, and the Price/Sales ratio at 2.5 is priced midway in the group with FactSet Research (FDS) top at 5.5, Jupitermedia (JPM) also at 5.5, followed by ADS at 2.5, PROQUEST (PQE) at 2.0, and DST Systems (DST) at 1.7. Thus, valuation related to this parameter is also reasonable. Looking at other statistics from Yahoo, we find that there are 83.6 million shares outstanding. As of 5/10/05 there were 2.35 million shares out short, representing 2.90% of the float or 2.5 trading days. The chart looks strong, having broken through resistance in April, 2003, and has headed higher since passing through this $17 level. The chart appears to be moving higher without being 'over-extended'. (imho). So what do I think? Well, this is a stock in my trading portfolio that I actually own. Latest quarter was strong with raised guidance. The Morningstar.com also looks strong, and valuation is reasonable if not cheap. The chart also looks steady. Thus, I shall be holding on to this stock until it hits that 30% target on the upside (around $50.83), or I shall be unloading all of my shares at the (8)% loss level (around $35.97). Hopefully it is the former! I hope this new review is helpful to you in knowing both what the stocks I actually own are, and hearing about so many other possibilities equally worthwhile! Drop me a line at bobsadviceforstocks@lycos.com or leave your comments or questions right here on the blog! As I like to do, I use the weekend to review past stock selections on this blog in order to see how those stocks actually turned out a year later. I have missed a few reviews, so it works out that I am now about 60 weeks out from this trailing one year review. Each week, I move ahead another week and see "what happened". This week I am up to the week of June 28, 2004. In my "real" trading account, I do not use a "buy and hold" approach. In fact, I sell my stocks quickly if they hit an 8% loss, and sell my gaining stocks slowly piecemeal, as they advance. But for the sake of this review, we shall be assuming a buy and hold approach and examine the weeks picks as if we had bought an equal dollar amount in each of the selections and see how we would have done if we had purchased all of them. On these reviews, I also give each stock a 'thumbs-up' or a 'thumbs-down' when reviewing their latest earnings report. In order to get a 'thumbs-up', I insist that both earnings and revenue show positive growth over the prior year. That is what it means, in case you were wondering :). On June 28, 2004, I posted Aeroflex (ARXX) on Stock Picks at a price of $13.66. ARXX closed at $8.93 on 8/26/05, for a loss of $(4.73) or (34.6)%. On August 16, 2005, ARXX reported 4th quarter 2005 results. Net sales for the fourth quarter ended June 30, 2005, came in at $128.0 million up from $125.3 million for the same period in the prior year. GAAP income from continuing operations for the quarter came in at $.03/diluted share down from the prior year's $9.0 million or $.12/diluted share. On June 29, 2004, I posted Getty Images (GYI) on Stock Picks at a price of $58.90. GYI closed on 8/26/05 at $84.08 for a gain of $25.18 or 42.8% since posting. On July 26, 2005, Getty Images reported 2nd quarter 2005 results. Revenue grew 23% this year to $185.3 million, up from $150.3 million for the quarter ended June 30th last year. Net income came in at $34.0 million or $.53/diluted share up from $25.2 million or $.41/diluted share last year. In addition, the company increased guidance for the rest of 2005 to revenue in the range of $728-$735 million and earnings/diluted share of $2.20 to $2.26. This combined solid earnings report with raised guidance is the "one-two punch" that results in a higher stock price! On June 30, 2004, I posted Navarre (NAVR) on Stock Picks at a price of $14.39. NAVR closed at $7.08 on 8/26/05, for a loss of $(7.31) or (50.8)%. On August 2, 2005, Navarre reported 1st quarter 2005 results. Net sales increased 10.6% to $140.8 million for the quarter ended June 30, 2005, compared with net sales of $127.3 million for the same quarter last year. Net income, however, was flat at $2.4 million or $.08/diluted share, compared with $2.2 million or $.08/diluted share last year. On June 30, 2004, I posted Scotts (SMG) on Stock Picks at a price of $63.88. SMG closed at $80.95 on 8/26/05 for a gain of $17.07 or 26.7%. On July 28, 2005 Scotts Miracle-Gro announced 3rd quarter 2005 results. Revenue for the quarter ended July 2, 2005, increased 18% to $910.8 million compared with $769.1 million in the same quarter the prior year. Net income, however, dropped 11.7% to $88.5 million, from $100.3 million last year, due to non-recurring charges. On a per share basis, this was a 14.3% decline to $2.58/share down from $3.01/share last year. The street is still optimistic about the company and the stock moved higher. On June 30, 2004, I posted Boston Scientific (BSX) on Stock Picks at $42.80. BSX closed 8/26/05 at $26.23, for a loss of $(16.57) or (38.7)% since posting. On July 19, 2005, BSX announced 2nd quarter 2005 results. Net sales grew 11% for the quarter ended June 30, 2005, to $1.617 billion, up from $1.460 billion last year. Net income, including "special charges" dropped significantly to $205 million or $.24/share this year, down from $377 million, or $.44/share in the same quarter last year. Finally, on July 1, 2004, I posted Tempur-pedic (TPX) on Stock Picks at a price of $14.45. TPX closed at $15.22 on 8/26/05 for a gain of $.77 or 5.3% since posting. On July 21, 2005, Tempur-Pedic announced 2nd quarter 2005 results. For the quarter ended June 30, 2005, net sales grew 27% to $192.6 million, up from $151.6 million in the second quarter of 2004. Net income came in at $24.8 million or $.24/diluted share, up from $16.9 million or $.16/diluted share, working out to an increase in net income of 47%. So how did I do for this week a little over a year ago? Actually it was a tough week for me picking stocks. I had three stocks gaining and three stocks losing. The average performance was a loss of (8.22)% on these six stocks. Thanks so much for stopping by and visiting. Remember that past performance is not a guarantee of future results and that you should consult with a professional investment advisor prior to making any investment decisions based on information on this website! If you have any questions or comments, please feel free to email me at bobsadviceforstocks@lycos.com or just go ahead and post them right here on the blog. I hope everyone has a great Sunday and a great week trading next week!